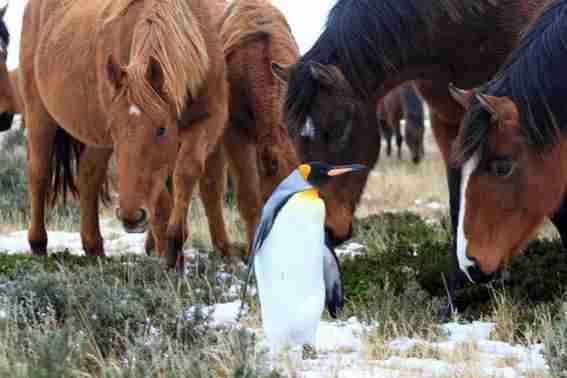 A herd of horses on the Falkland Islands, in the South Atlantic Ocean, were treated to quite a delightful surprise recently as a King penguin decided to mosey on by for an unexpected visit. As photos show, the horses couldn't have been happier with their regal-looking guest. Sarah Croft, an officer from Falklands Conservation, told The Dodo that she had just finished feeding the herd when their ears suddenly perked up as the penguin approached. "He caught all of their attention. 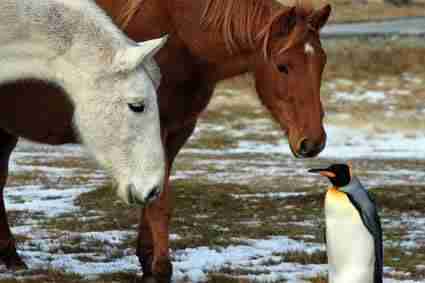 From afar, the horses were just curious, but then the penguin got closer and some of the horses came in for a closer look," she said. "They've never seen a King penguin before, so I think they were quite fascinated with what it was." The penguin, who had wandered inland from the nearby coast, seemed unthreatened as the large, curious animals all gathered around for a gander. Still, it seemed as though the flightless bird was mostly just interested in getting where he was going. "The horses followed him around for about an hour," Croft said. "I think they were really quite taken by the penguin, more than he was taken by them." 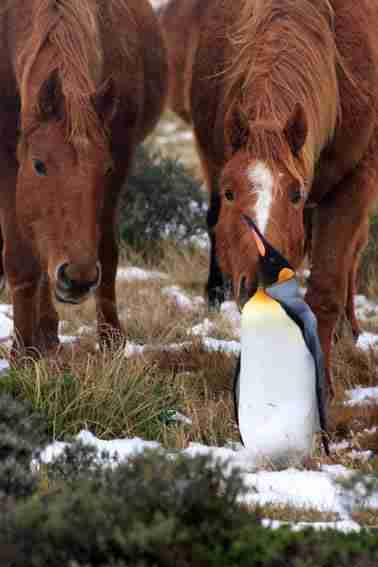 "You don't see horses and penguins overlapping very much. I think it's a uniquely Falklands encounter. 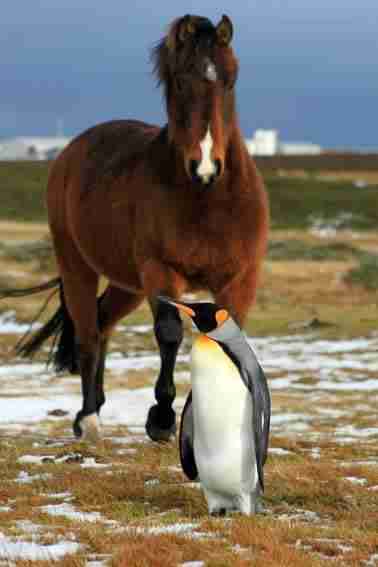 We have horses on the Falkands, and it's right in the northern range of the King penguin." 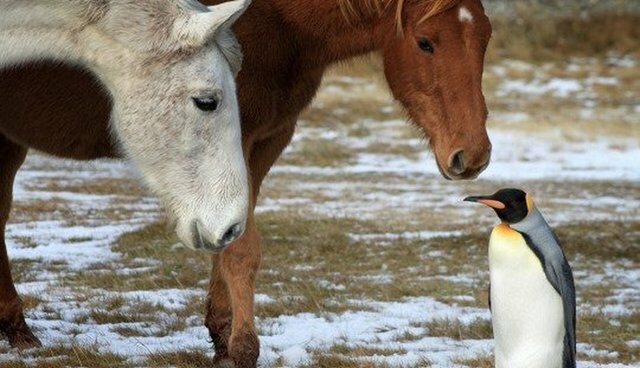 Despite the differences in their size, species, and formality of their attire, the unlikely reunion between penguin and equine was surprisingly pleasant. "I've never come across anything like it before," said Croft. "It was just one of those moments - very novel, quite unique. Just seeing it, I was amazed."